Now what 70s kid never had a set of these? 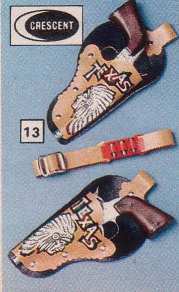 Would always be running round in my younger days with these loaded full of caps and ready for any quick-draw contest. The funniest thing involving these guns didn’t involve me tho. My step brothers were watching a western film on telly one night when the youngest, all decked out in his double holster pistol set decided it would be a good idea to re-enact part of the movie by crouching behind the settee then jumping up and giving his brother a crack over the head with the gun handle. Now these guns were made of die cast metal and could do quite a bit of damage as my step brother could testify with 6 stitches in his head.